Welcome, Lora. — HELLO, NORAH. It’s officially been one week since Norah’s little sister made her debut into this world (excuse me, but HOW IS THAT EVEN POSSIBLE?). Now that we’re slightly less delirious, we thought we’d share some more about her birthday! Thanks to some pesky high blood pressure readings, we had gone into the Maternal Assessment Center at the hospital Saturday morning to have some BP monitoring done, and the results led my doctor to decide it was time for a birthday party. 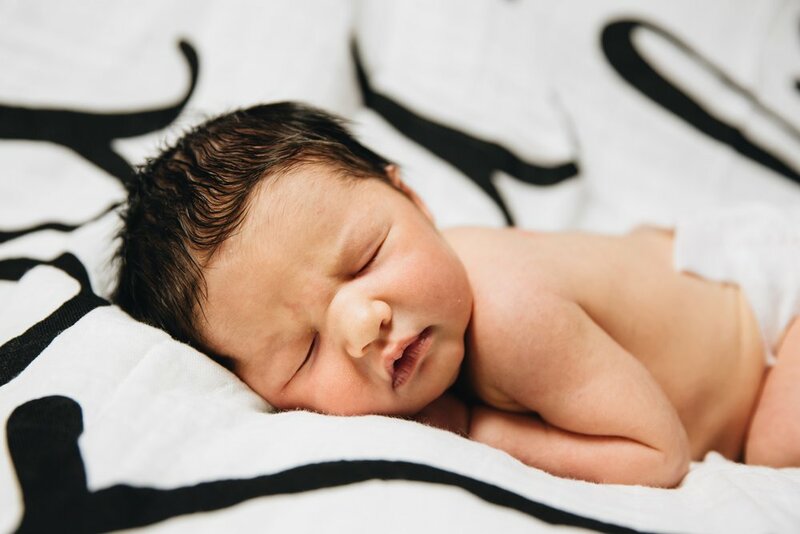 My BP would spike and then come back down, but the highs were getting higher, and high BP for any length of time can start to damage the placenta, so my doctor didn’t want to wait any longer to see what may happen. So, as per usual with our girls, our plans changed. A lot of the c-section was how I remembered it with Norah: the cold operating room, the warmth that rises from your toes to your belly after the spinal block starts to kick in, the fear of becoming that news special where the numbing doesn’t work and I feel everything, the relaxation felt as soon as Lane was by my side (beard bonnet and all), and the scent of lavender from the aromatherapy stick placed near my face (yes, to me, a c-section smells like a spa). But a lot of it was also very different: casually walking myself into the operating room instead of being rushed in on a cart on all fours being pumped with oxygen and fluids in the hopes of increasing Norah’s heart rate, peaceful waiting as the room was being prepared instead of multiple teams of people rushing about, knowing that the pressure I felt beyond the curtain was normal and meant we were just one step closer to meeting our baby girl. At 1:44pm on Saturday, January 12th, Lora Renae entered the world at a healthy 7lbs 9oz and 19in long. Her name comes from a combination of my mother’s name – Lori – and her big sister’s name – Norah. This time, instead of hearing the words “she’s here!” followed by a piercing silence, we heard Lora cry. We heard her precious lungs fill with air and release the most beautiful (and impressively ear-piercing) “Hello” into this world. We have waited years to hear the voice of our child (because of her Trisomy 13, Norah never made a sound) and the holy magnitude of that moment brought us all to tears. 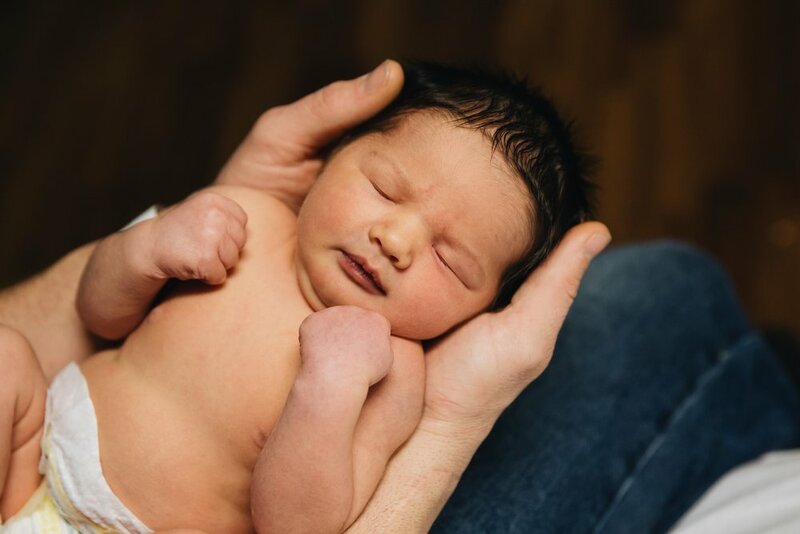 This time, instead of Lane watching protectively through the glass as our daughter was worked on by her own medical team, he cut the cord and held Lora in his arms. This time, instead of being whisked away to a team of specialists, Lora was placed directly on my chest. Lora entered this world like a champ, acing every test and exam they put her through. She was a little more pale than they liked, but being born is hard, guys, and it can take a bit for the body to adjust. After being placed on my chest, she quickly pinked up and we were off to recovery. ”there’s something very wrong with your baby and you need to tell me what you want us to do." before I had even seen my daughter. The same room they took me out of earlier than usual in order to avoid sharing space with a mother who had her child in her arms. This time, there was no rush. This time, there were just numb legs and baby snuggles. This time we were there as a family. 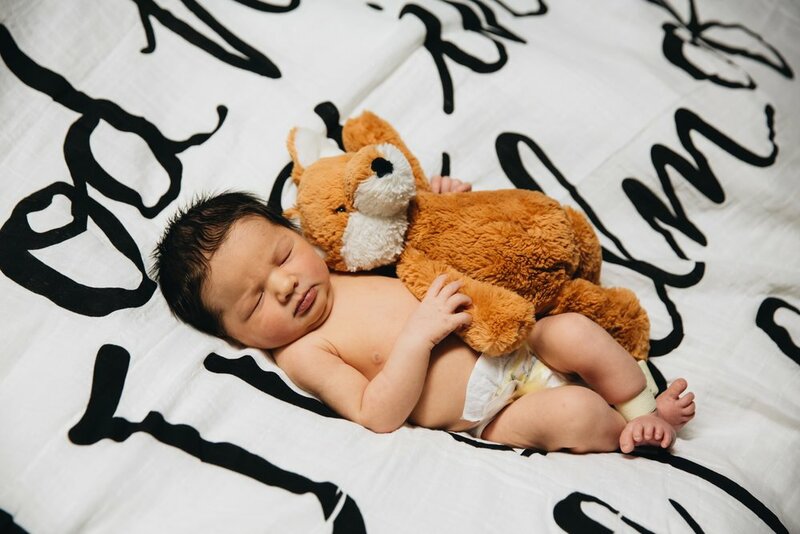 After recovery, we were brought to our postpartum room where we spent the rest of our time healing, bonding, learning, and getting to know this new little human. The next few days were spent showing off our baby girl, taking tons of photos, getting little to no sleep, and eating a bunch of hospital food (plus one AMAZING meal from Tacocat. 10/10 would recommend). 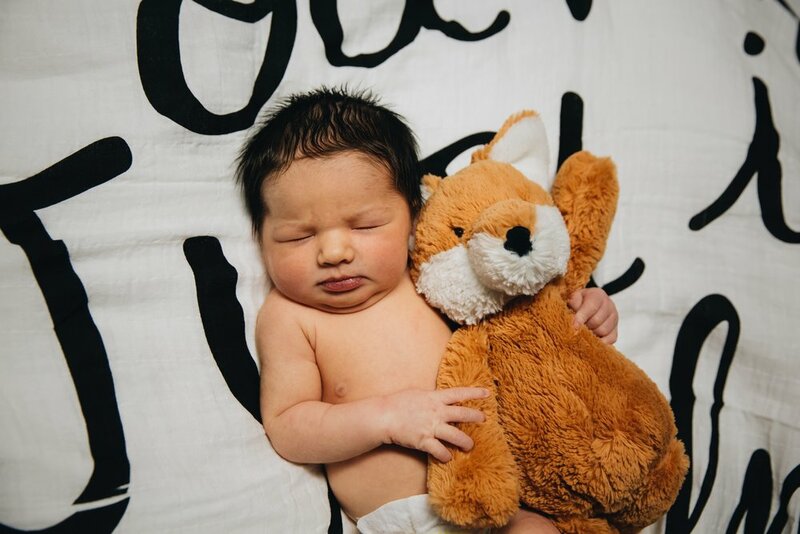 We also had the hospital photographer take some photos, and now we’re totally obsessed. We’re all doing really well. My blood pressure normalized as soon as the c-section was over and Lora has more than excelled in every way, acing every single test thrown at her. Leaving the hospital with Lora was an experience there really aren’t words for. With Norah, we were escorted out, arms empty but for a small box of keepsakes to remember our daughter by. Even simply having a ‘going home’ outfit was a hard concept for me to wrap my head around; I had only picked up Lora’s outfit a week or so before she was born. But dressing her, packing our bags, fitting her in the carseat that was meant for her sister, and getting in the car and going home… there aren’t words. Happy tears, complex tears, shouts of joy towards the heavens but also a lot of questions of “why?”. Pregnancy after loss is a beautifully complex experience. Parenting after loss is no different. We’re a family of four now, with one of our girls in heaven and one in our arms. I’m also learning to mother a living child without my own by my side. But every time we say Lora’s name, we honor and remember both Norah and Mom, and that is an incredible gift. Welcome to the world, Lora. We can’t wait to see what God has in store for you. PS – you have the best guardian angels a girl could ask for.